We have reached the fag-end of the state wise culinary journey and today, we are in Uttar Pradesh. Regular day-to-day lunch is the common dal-chawal-subzi-roti combination (Rice with dal, roti and veggies), so I thought I would turn to the capital city Lucknow’s rich Awadhi cuisine. 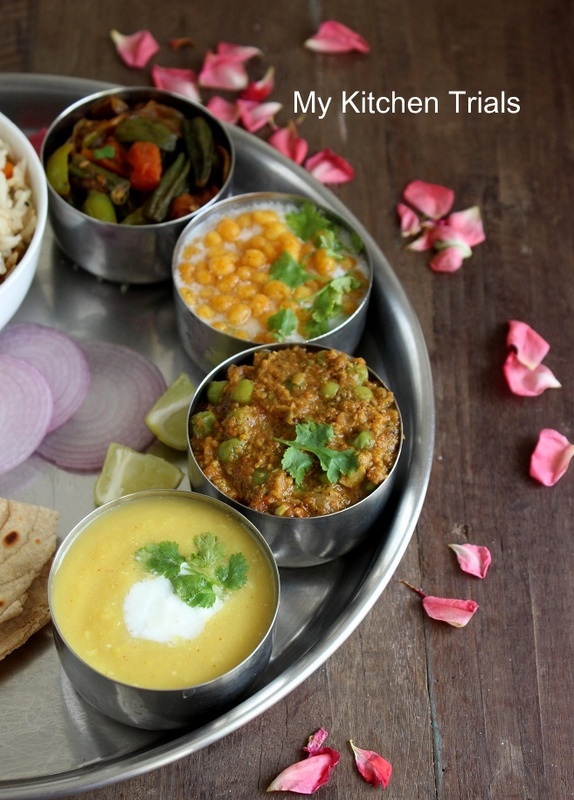 Just like how I turned to Vaishali’s space for the Gujarati thali and the Delhi food fare, her Awadhi Thali was the first thing to come to my mind once I finalized on the Lucknowi food. Awadh is the current Lucknow (and some surrounding regions) now and is known for its royal Nawabs and rich food fit for the kings. Dum style cooking (slow covered cooking over low fire) is what the place is most famous for. The thali here is a simple affair with a nawabi pulao that’s cooked in milk. Sultani dal is nothing but toor dal made rich with yogurt, cream and milk. Mattar ka nimona which is a green peas preparation. The bhindi is cooked in dum, though I couldn’t make out too much of taste difference. Boondi ka raita is a simple yogurt prepared with ready made boondi(gram flour mini dumplings). The lachha paratha is a favourite with my son. The rice too turned out to be good for my son since it was not spicy. Nawabi Pulao : A simple pulao cooked in milk. I added the vegetables too at the time of cooking itself. This is then layered and baked later. Lachha Paratha : A layer pattered paratha. Hi Rajani, you have posted a fantastic collection of recipes from different states of India. A great repository of information! Well done :) I can always look at your blog if i have to make any new dishes from other Indian states!! Omg, those layers in lachcha paratha are simply awesome, one more delicious thali from you, i cant resist to that bowl of pulao..just had my breakfast and am hungry now. That is one rich and delicious thali. Lachcha parathas are absolutely stunning and all the accompaniments sound perfect. Lachha paratha has turned out very well and perfect layers..loved the idea of sprinkling the rose petals..
Splendid presentation. Love the rose petals sprinkled all over! Wonderful thali again! 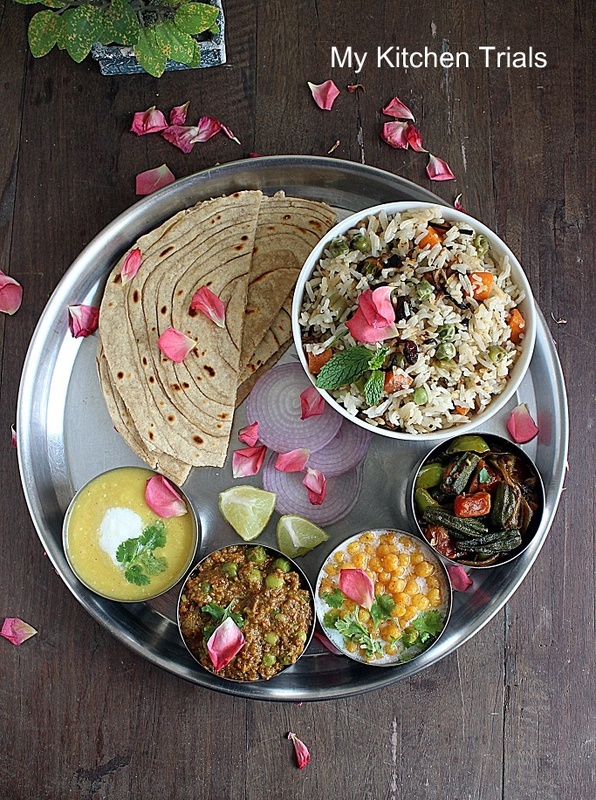 Everything on the thali looks amazing and delicious! Wow what a platter? This fit for kings. That’s a colorful platter with Nawabi khana.